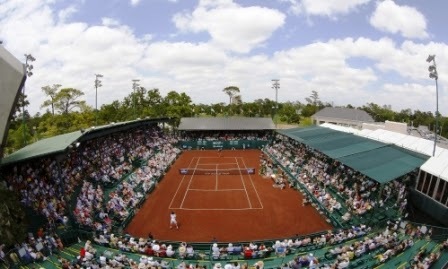 Field Trip: Meet Coach Sam Chadwell at River Oaks Country Club and enjoy an afternoon watching world class tennis players compete for a position in the main draw of our country's National Tennis Championship played on Clay. Come and go as you please. This is a great opportunity to see some AMAZING tennis and it's all absolutely FREE. Elijah and I will be there Sunday, April 6, but matches will also be available Saturday, April 5. Mark your calendars now. More information will be added to this page, soon. If you have never watched a live pro tennis match before you are missing out on something very special. There are few tennis experiences more inspiring for an up and coming player than to watch a professional tennis match up close and personal. Here is a photo of my son Elijah Chadwell watching one of the Clay Court competitor's during a practice session during qualifying weekend back in 2011. Make plans now to take advantage of this great opportunity. I hope to see you at the US Men's Clay Court Championship this April. Welcome to the opening post of my new blog. This blog will become be my primary internet presence as I transition from a broader community based tennis service business at multiple locations to a more focused private coaching and programming situation at Bay Area Racquet Club located at 17901 Kings Park Lane, Houston Texas 77058. Pictured to the right are my lovely bride, Monica and our son Elijah. Monica and I first met back in 2001 at Bay Area Racquet Club. We married in 2003, Monica is a professional artist and over the years our careers have taken us all over the greater Houston area. Both Monica, Elijah and our other son Connor are avid tennis players. One of our favorite activities is to attend local tennis events featuring professional or top college players. 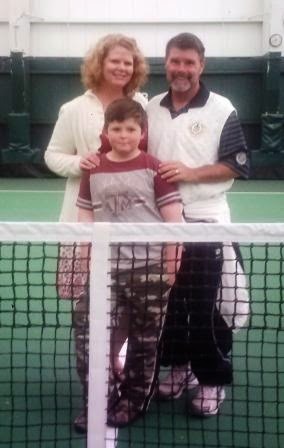 This family photo was taken during a college match held at the Houston Metropolitan Racquet Club in downtown Houston. Watching live college tennis action has recently become a passion of ours, especially if we are watching The Texas Aggies! Elijah loves the Aggies so much because his older brother, Connor attended Texas A and M. Connor is one of top athletes I have ever coached and definitely has the game to play top college tennis or even turn professional. Connor is pictured below to the far right. Pictured left to right are participants from my Clear Lake area home school program: Elijah Chadwell, and Noah Elsner. 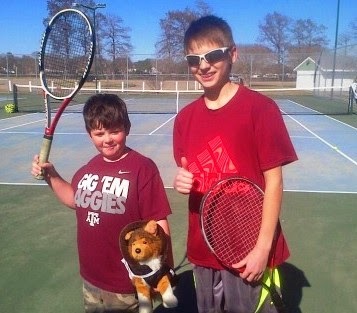 These boys love tennis and are also avid Texas Aggie fans. Elijah hopes to play tennis for Texas A and M when he is ready to start college. The Clear Lake home school group is comprised of participants from seven families. We have had as many as 18 participants and the program was previously maxed out on court space at Nassau Bay Park but the move to Bay Area Racquet Club will ensure program growth for many seasons to come. My title at Bay Area Racquet Club is 'Program Director' with a special emphasis on 10 and under programs, novice tournaments, junior team tennis, and home school programs. This is literally a 'dream' job that was designed specifically for me: tailored to fit my strengths and preferences, and I could not be happier! To God be the Glory! I am currently involved with several other coaching and management contracts through the spring. Over the next few months I will either be scaling back operations at these locations, or bringing them under the umbrella of the scope of my responsibilities at Bay Area Racquet Club. Devoted Husband and Daddy, Professional Tennis Coach, Disciple of Jesus Christ.